During the week ending Decemiber 7. 1968, Kansas,. tioned previously (MM\WR, Vol. 17. Nos. 47 and Ilh). period. Laboratory studies are pending. illness occurred in the Richmond and Tid(-ewater areas. laboratory data on these outbreaks are pending. wasr noltd during Ihe first w.'eek of DI)'ecbell.r. statess is depicted in IFigure 1. \s illustrated in igLurre 2.
an, the Latimer C'ounlty lli'ali l)eparftmnti onilI/l K.
Kpidi miolo>ly, \ 'u Yor/k Sate, c Dparltn'Irt if HII, ,/f. /lo/y. Uklldoima Statr lOeparimt'nif of lh al/ft, Pa'l '. City. Newi Jersey. occurred on Noaember 2S and 29. 196S. the meal were posit ie for Salmonella n tte'ritidit. investigation is now in progre-'. Director of Laboratories, iiiand Harold Rocifeld. .)iV.\l.. 1.277 i-olattion of thi- seroti pe reported in 1967. 19). and suboccipital headache, facial -I 1. i and nausea. 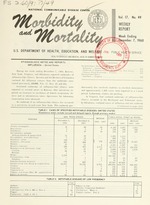 duration of illness. :t0 minute,- to 2 hours. D*1. ived reports: Meas .s: Vi. restcaurani used a 100 lb barrel of \I(1SG e ery 6 to S weeks. Division of K/pideltiilog/y. F/irida tatcr Boardl of Health. minutes after in estion of food containing excess \IMG. index case- a I ,, ear-old man, came to Hospital. Uruguay. north of Hospital. Ihile con alescing from smallpox. CHIEF, STATISTICS SECTION IDA L. SHERMAN, M.S. BASIS ARE RELEASED ON THE SUCCEEDING FRIDAY.